EndoGuide's, conical-shaped, microdiameter tip acts as a self-centering guide for straightline access to canals, maximizing treatment efficiency and conserving healthy peri-cervical dentin. SS White's EndoGuide Burs are a unique set of 8 burs for nonsurgical root canal treatment. The patented, conical-shaped, microdiameter tip acts as a self-centering guide for straightline access to canals, maximizing treatment efficiency and conserving healthy peri-cervical dentin. 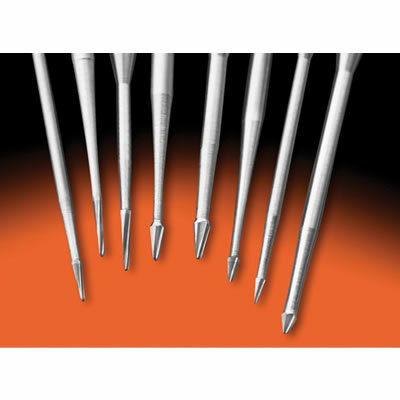 EndoGuide Burs facilitate increased tactile sense of dentin and calcified canals, provide a polished dentin surface for easier visual identification of hidden canals, and can reduce dependence on costly ultrasonic instrumentation. EndoGuide burs are available in taskspecific kits, for anterior/bicuspid or molar teeth, and 5-packs of individual burs. In this Dental Product Shopper review, 12 dentists' a mix of endodontists and general practitioners' evaluated EndoGuide burs on patients in their practices for 4 weeks and reported their findings. They rated and commented on EndoGuide's highlighted features, such as improved canal visibility and the conservation of peri-cervical dentin. EndoGuide burs are designed to achieve straight-line access from an incisally positioned, vertical angle. Their funnel-shaped design improves canal visibility as well. As compared to a round bur, EndoGuide's unique blade design polishes dentin to improve canal mapping. The self-centering feature of EndoGuide was called excellent by 1 evaluator, very good by 4, good by 6, and fair by 1. An evaluator with 33 years of experience in dentistry cited this as his favorite feature. One of the important benefits of EndoGuide is improved canal visibility. Three evaluators rated this feature as excellent, 3 very good, 4 good, and 1 fair. Another evaluator who practices in Dallas said the burs 'give extra visibility,' and 2 others called this the standout feature of the product. EndoGuide burs are specifically designed to maximize efficiency during endodontic exploration and access while conserving healthy tooth structure. EndoGuide burs blade design functions to effectively polish the dentin surface as it cuts, making visual dentin mapping easier and canal identification more precise. Regarding overall satisfaction with EndoGuide burs, 8 called them very good, 2 called them good, and 2 called them fair. An evaluator with 13 years of experience in dentistry liked the 'good instructions' and said, 'The product can be useful for tight canals.' Another evaluator liked the 'extra length of the shafts' and gave EndoGuide an overall satisfaction rating of very good.